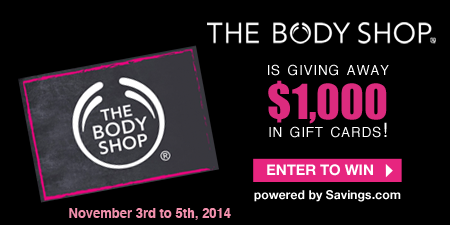 The Body Shop Gift Card Giveaway | A Savings WOW! Do you love The Body Shop? Make sure to enter this giveaway for a chance to win one of forty (40) $25 The Body Shop gift cards. HURRY and get your code here for 40% off all orders at The Body Shop through November 5, 2014. There is no minimum purchase required to use the code. Free shipping and gifts are included on orders of $50 or more. Restrictions may apply. There are only 6,000 codes available, so be sure to get your special code while they are still available!